Richard Peters from the Rupununi was able to hang on long enough to make the judges’ cut and walk away with a cash prize for the bare back bronco competition. If you are a fan of the bull riding, steer roping, steeds and cattle, then the Rising Sun Turf Club was the place to be yesterday. At the venue, many of the nation’s top cowboys competed for honors in the annual Rising Sun Rodeo. 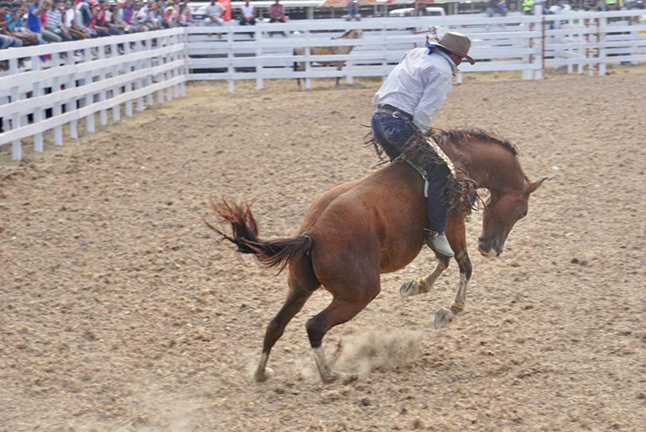 The event which is a staple on the turf’s calendar saw performances like Wild Cow Milking, Calf Roping, Steer Roping, Bare Back Bronco, Bull Riding and Saddle Bronco being contested. Vaqueros from Brazil, Suriname and Venezuela were also on hand to match their skills with the locals. Between riders, the rodeo clown told family-friendly but slightly off-color jokes to the crowd that filled the bleachers.